Comic book publisher IDW’s Jem and the Hologram main title recently came to an end. But, thankfully, that’s not the end for Jerrica and the gang; this November sees a new Jem series. Dimensions will be a new anthology series featuring rotating talent and stand-alone stories. The first issue will feature a Dungeons and Dragons inspired tale written by Kate Leth (recently off Marvel’s Patsy Walker, A.K.A. Hellcat!). 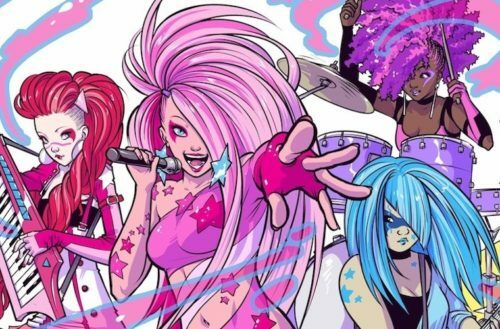 In advance of the new Jem comic series — and because, seriously, IDW’s Jem comics are outstanding — we thought we’d share a few of our favorite storylines. All issues of the original line, written by the brilliant Kelly Thompson, have been collected in trades (as has the Misfits mini-series), which makes it easy to read them yourself. Though the comic uses the original show as a template — it adapts storylines like Shana’s time in Italy as a fashion intern — it’s not afraid to make changes. In the comic book, the Misfits already have Jetta in the band — and like creator Christy Marx originally wanted, she’s black. Early in the run, however, the Misfits get a new member. Pizzazz, the lead singer, gets in a car accident and damages her voice. Because the Misfits already have a tour booked, they need a temporary replacement singer. Blaze gets the gig — but worries that she might not be accepted by the other Misfits, since she’s trans. Thankfully, the other Misfits don’t even have a problem — they might be the antagonists, but they’re not bigots. Blaze is welcomed into the group, and when Pizzazz came back, Blaze stays in the band, moving to lead guitar. Blaze was created by the original artist and co-creator (with Kelly Thompson) for the IDW Jem series. Sophie Campbell. 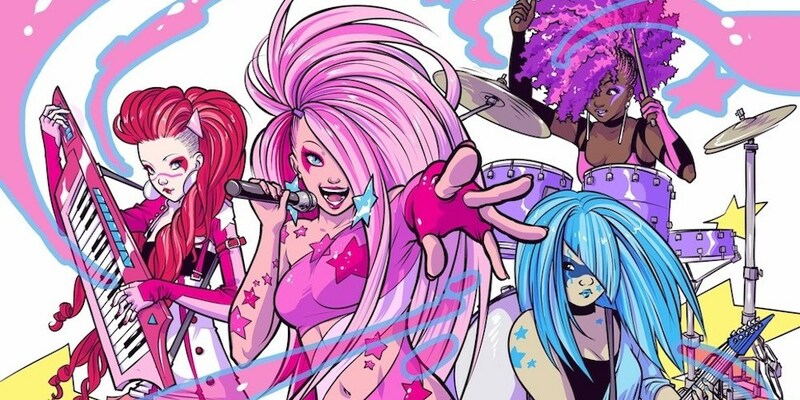 Campbell designed all the characters for the updated Jem comic. In the first trade collection, Showtime, Campbell’s afterword talks about how she re-designed the Jem characters back in 2011 for an imaginary revamp. No wonder she got the gig when a real revamp happened. Speaking as a reader, it comes through. It’s that honesty and openness that makes Jem a delight to read. 2. Kimber and Stormer 5-Ever! Many fans of the original TV series shipped Kimber and Stormer. Seriously, how could you not after the episode “The Bands Break Up,” where Kimber and Stormer record their own solo album, Back to Back? Everybody knows the bad guys are more interesting. And in the Misfits miniseries — collected in the aptly titled volume Our Songs Are Better — we find out a lot about the band. The miniseries is five issues, one for each Misfit. In the series, we get the backstory of each of the Misfits. Pizzazz, Roxy and Jetta’s backstories are similar to their cartoon counterparts — Pizzazz is a lonely rich girl, Roxy can’t read and Jetta’s not British. Blaze, not having a cartoon counterpart, has her own story about a secret that may tear the Misfits apart (it doesn’t). Stormer’s story, however, points to another one of the things the Jem comic improves: body diversity. While in the cartoon, both the Holograms and Misfits all had one body type — just like the original dolls. But in this one, Stormer’s heavy-set, Aja is short and chubby, and Kimber’s tall and flat-chested. In the miniseries, Stormer’s issue is about fighting against body shaming — and it’s awesome. The entire miniseries shows how the Misfits truly are a family. And it’s surprisingly sweet — just don’t tell Pizzazz. The cartoon hit on this a bit, but in the comic, Jerrica’s identity crisis is much bigger. Though Jerrica usually squared herself away at the end of each episode, this time, it’s not as easy. Jerrica’s having a much harder time keeping things straight, even with the other Holograms. It’s not uncommon for Jerrica to talk about Jem like she’s a completely different person — and vice versa. And through Meredith McClaren’s art in this arc, we really see the amount of distress Jerrica’s under. One great comics tradition is the non-canon Annuals. In these, generally the creators get to stretch their legs a little bit and just get goofy. Sort of like the Simpsons‘ “Treehouse of Horror” episodes. Just with less horror. Usually. The Jem annuals are no exception. Both involve the what-if stories from the characters; in the first, the Holograms are having a sleepover. In the second, the Holograms discover a comic by the Starlight Girls starring themselves. Either way, they’re pretty fun — though our favorite is the first annual, which has Jem versions of Jim Henson’s Muppet Babies, Mad Max: Fury Road, Star Wars and Teen Wolf. It’s utterly delightful. The final Jem comic collection, Truly Outrageous, came out July 11. The Misfits miniseries collection Our Songs are Better came out August 8. The Jem and the Holograms: Infinite series is in comic stores now. Jem and the Holograms: Dimensions comes out November 29.